Well, now comes not just a mainstream doctor, but one of the most mainstream docs of all, saying don’t worry about saturated fat. How mainstream? How about the president of the World Heart Federation? Is that mainstream enough? Dr. Salim Yusuf is the Marion W. Burke Chair in Cardiovascular Disease at McMaster University Medical School in Hamilton, Ontario, Canada and the lead investigator in the Prospective Urban and Rural Epidemiological Study (PURE). If you haven’t seen the short video below, take a look. It’s been all over the internet, but was taken down, probably because the results Dr. Yusuf presented were not in publication yet. It is no breach of protocol to present such findings to medical and scientific groups pre-publication, which is the case here, but perhaps that’s why the videos have been removed previously. This version has been available for about a week, so I’m guessing the powers that be in this situation gave up playing YouTube whack-a-mole. Before we get all fired up and start thinking the findings in this study actually mean something, let me remind you it is an epidemiological study (also called an observational study) and as such doesn’t mean squat. I wrote a piece a while back on why observational studies can’t be used to prove causality. They are pretty much worthless for anything other than establishing hypotheses to be tested using randomized controlled trials (RTCs). After writing the piece linked to above, I caught some flack from a few people I respect for not painting the complete picture of observational studies. These folks believe that although observational studies can’t ‘prove’ that A causes B, they can make a serious argument that A doesn’t cause B. In other words, if I ask 50,000 people to fill out food frequency questionnaires, wait for ten years to see how many have heart attacks, and find that those who did have them ate a little more saturated fat than those who didn’t, I can’t legitimately make the claim that saturated fat causes heart disease. * But if instead I find that there really isn’t any correlation whatsoever in saturated fat intake and heart disease (or the data show that those who had heart attacks ate less saturated fat), then I can reasonably say saturated fat probably isn’t a cause of heart disease. I’ve been meaning to go back and make that correction to my post, but haven’t gotten around to it yet. Now, realizing we can’t determine any kind of causality from this enormous observational study, what conclusions can we draw? I’ll give the time on the video and tell you what I think we can conclude. 1:15 Carbs are bad. 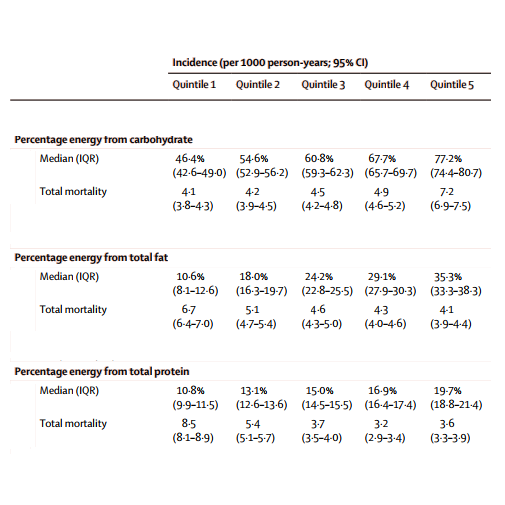 Shows carbs probably aren’t protective against cardiovascular disease. 1:40 Increasing fat protects us. Contrary to the advice from the AHA and other advisory groups, I would say this shows fat doesn’t hurt us. 2:48 Saturated fat is not harmful and may be beneficial. Shows saturated fats are not harmful. 4:02 No evidence 1 percent or 2 percent milk is any more healthful than whole milk. That says it all. 5:00 Why did we go wrong? This is an important part of the presentation. Dr. Yusuf asks how we went so wrong on saturated fats. He makes the case that we went wrong because we looked at surrogate endpoints. In other words, we looked at what saturated fats do to LDL-cholesterol, which was assumed to be a risk factor for heart disease, i.e., a surrogate endpoint. It’s a lot easier to look at surrogate endpoints than real endpoints, i.e., heart disease itself. When saturated fat intake was compared to heart disease (instead of the surrogate endpoint of LDL), the PURE study found an inverse relationship. The more saturated fat eaten, the lower the rate of heart disease. 6:08 Carbohydrate intake vs ApoB/ApoA ( a sort of surrogate for triglycerides/HDL) shows carbs worsen the ratio. Doesn’t really prove anything other than carbs probably aren’t protective. 6:43 Saturated fat intake vs ApoB/ApoA shows the opposite of carb intake. Means to me that saturated fats aren’t harmful in terms of what they do to lipids. 6:54 Monounsaturated fat (MUFA) vs ApoB/ApoA shows great improvement. 7:12 PUFA are neutral in terms of ApoB/ApoA change. In his talk, Dr. Yusuf makes the case that red meat is okay in moderation, but he doesn’t really tell us what moderation is. And, if the truth be known, I doubt he knows. But what we can derive from his results with the various fats and ApoB/ApoA is that saturated fat tends to the protective, MUFA is protective and PUFA are neutral. (Again, this kind of study can’t show causality, so I’m talking in terms of what conclusions we can draw, which are that none of these fats is harmful, and if any is protective, it would be the MUFA.) If you look at the kinds of fats in red meat, you find that beef, for example, contains about 4 percent PUFA, 46 percent saturated fat, and 50 percent MUFA. So, based on Dr. Yusuf’s date from the PURE study, he should be recommending red meat out the wazoo. The next third of his talk is on sodium intake and makes the point that we probably need to increase the amount of sodium were consuming. And that we should change the AHA values as to what is a healthful intake. He does make a couple of interesting points in addition. 12:34 Stop and think for a minute. Sodium is an essential nutrient. So why would we want to restrict it to next to nothing as most cardiologists would have us do. 13:02 The first line of defense against infection in the skin is sodium. Which is why the largest part of sodium in the body is stored in the subcutaneous (under the skin) fat. 13:50 Why do epidemiologists think you should lower sodium “all the way down to your boots and people will live forever?” Good question. 13:59 People have used the data from the Yanomami Indians to show that lower sodium intake means lower blood pressure. Which is true. But the Yanomami have a life expectancy of 32 years. And die overwhelmingly from infection. 14:43 Conclusions about sodium. All the recommendations are way too low. 15:30 Dr. Yusuf starts on fruits and vegetables. His study shows that a couple of servings of fruit per day is protective against heart disease, which means that a couple of servings of fruit per day probably isn’t harmful. Vegetables of all kinds have no effect one way or another, which means they’re probably neutral. 17:40 He starts on legumes. The PURE study does show a fairly strong protective effect for legume consumption. Which, of course, means legumes probably aren’t harmful. But you’ve got to remember that the PURE study was done across a number of countries and a vast array of socioeconomic groups and the data were pooled. Legumes are doubtless the major protein source for many of the groups studied, and since protein is an essential nutrient, it stands to reason that getting enough of it – even if from legumes only – is a good thing. In terms of a low-carb diet, the problem with legumes is that they come with too much carbohydrate. I suspect that if you’re getting enough protein from meat, legumes won’t add much to your health. Of course, that’s my speculation based on my own reasoning and not on the PURE data. 17:50 Dr. Yusuf goes into the economics of fruit and vegetable consumption across the world. I was surprised to learn that people from most low-income countries don’t eat many fruits and vegetables, because they can’t afford them. Here in the US, fruits and veggies are dirt cheap as compared to meat, so I always figured people from low-income countries would eat more fruits and vegetables than those in high-income countries. But not according to Dr. Yusuf. He didn’t really get into what they did eat. I assume it isn’t meat because that’s got to be more expensive than fruits and vegetables. I guess it’s rice and other grains. 19:30 Shows that in low-income countries, the cost of 2 servings of fruits and 3 servings of vegetables per day represents from 30 percent to 60 percent of their income. And even when they grow these foods themselves, they don’t eat them – they sell them as a cash crop. 20:15 Dr. Yusuf’s conclusions. This is where he really goes on a rant and over-interprets his data. But at least he over-interprets in a good way. If you don’t watch anything else, watch this last couple of minutes. He starts right off saying that recommendations to restrict saturated fat have no scientific basis. Then he turns for confirmation to Nina Teicholz’s book The Big Fat Surprise, (you really need to read this book if you haven’t already; here is my review) which he says has shaken up the nutrition world. He seems stunned to have learned that the foundation for the lipid hypothesis for fifty years, the data for The Seven Country Study by Ancel Keys, had been cherry picked. Funny because low-carbers have known that for years. Note: As Dr. Zoë Harcombe pointed out to me, there is a general misunderstanding between the actual Keys study Seven Countries and his six countries graph. It is the latter that Dr. Yusuf is actually referring to when he mistakenly calls it the former. Note #2: Dr. Yusuf subsequently apologized for the error. Now those of you who have been around for a while should know that when someone with Dr. Yusuf’s status in the world of cardiology says something as mutinously radical as saturated fats are not dangerous, the long knives will come out. And they have. All the usual suspects are gnashing their collective teeth over Dr. Yusuf’s perfidy. David Katz, chief nutrition expert from Yale, called the report “bizarre” and “misguided.” Plant-based dietary proponent Joel Kahn piled on along with Marion Nestle and Yoni Freedhof, the guy who posted the now-famous video of Kevin Hall. Had these folks not been so paranoid and so intellectually blinkered, they could have sniffed this off as simply an observational study and therefore meaningless in terms of causation. But they didn’t. Instead they turned on one of their own and savaged poor Dr. Yusuf. I guess it’s true: no good deed goes unpunished. *Whenever I discuss this kind of study, epidemiologists alway take me to task for not mentioning the Bradford Hill criteria for observational studies. So, okay, here I am mentioning the Bradford Hill criteria. The Bradford Hill criteria basically say that if the effect is so large as it was in smoking (something like smokers got lung cancer 15 times more frequently than non-smokers), then you can attribute causality. I know, I know, you probably don’t have the time to do something like that anymore, because you’re now a travelling appliance salesman, writing your blog posts from your airline seat. But it was very cool, and over the years I’ve sent it to many, many female statin users. By the way, I note that your original blog about Dr. Manson’s announcement, here: http://bit.ly/2dbAbbN , has a non-working YouTube link in it these days, so that readers don’t also get to watch the video. I would have done that had I only thought of it. Takes less time than writing it all down. Thanks for the heads up on the non-working link. I fixed it, so should be fine now. I think it was a victim of my theme switchover. Hey, if it’s actually easier for you, then maybe it’s not too late. Well, something to think about, at least. I wonder how many of your readers will print out your text annotation and actually follow along, since everyone is on information overload these days. Whereas, with the video technique the annotations would be immediately and perfectly associated with the messages from the video, and provide the discussion in an entertaining format (yes, many of us find you entertaining) that requires nothing from the readers other than to munch pork rinds absent-mindedly while watching and thinking. And I’ll bet it would rack up quite a number of views on YouTube, over time. About nine years ago, MD and I developed the first sous vide cooking unit for the home cook. Since that time, we’ve devoted most of our time to marketing and promoting that product, which now sells all over the world. So, that’s what I mean when I say my career as an appliance salesman is gobbling up all my time. The brilliant fantastic AMAZING Sous Vide Supreme — Mike NEVER wants to toot his own horn (and dammnit! He should!) My husband bought me the first one when it was released, and a year later, replaced with (well, added to it!) with the “baby” SVS. (In my paean to it on his blog, Mike gently chided me for calling it a ‘baby’ — he said perhaps a “teenager,” because it was only 16% smaller that the first one.) No matter — BRILLIANT machine! I use it all the time; I’ve held ‘tastings’ for friends and neighbors and blown them away! Okay. I winced and posted it. Thanks for the great (and unsolicited) testimonial. I just found out about this tool on Friday. I’m off to check yours out…my friend swears by it. She said it makes a perfectly cooked rib eye. It does do that, indeed. Thanks for posting those links, I have passed them along to a female friend who takes statins because she is scared not to, as well as Dr. Eades Mother of all Statin posts. I can only hope she listens. This was meant for George’s post above. I don’t know how it ended up here. Just for the record, I much prefer the written commentary and summary – much faster for thousands of readers. Agreed – much prefer written comments. Thanks for posting your comments about this Dr Mike. I had seen Dr Yusuf’s talk on YouTube when it first came out. I was pleasantly surprised at what someone so ‘mainstrem’ was saying. I was also surprised that there wasn’t more on the internet about this, nothing in the press (though maybe I missed it), and nothing critical from other ‘mainstream’ doctors. I was waiting – I hadn’t realised the video had been taken down on occasions, and I see from what you wrote that Dr Yusuf has been ‘attacked’ by others now. Do you know when Dr Yusuf’s results be published ? I wonder what will happen when they are ? Many parts of the PURE study have already been published (it looked at a lot more than just hat Dr. Yusuf discussed on the video), so I expect it will come our relatively soon. But when exactly is anyone’s guess. Thanks, this is a really helpful summary of the presentation as well as a good reminder not to over-interpret the data. I’d seen the video and wondered if Dr. Yusuf wasn’t a bit over-enthusiastic regarding his discoveries and conclusions. But then I remembered my own “holy smokes” feeling when I first encountered some of these challenges to nutritional orthodoxy (starting with Nina Teicholz’s book), so maybe his reaction is not so surprising. Exactly – I picked up right away that Dr Yusuf has just realised this truth; this is why he is as outspoken as he is. Had he already known this stuff for a few years, he would have phrased it differently, and not offended Ancel Keys’ friends so much. But instead, he’s feeling the same outrage we all felt at first, and not trying to soft-pedal anything. Thanks for summarizing this (with analysis). I don’t watch videos. Thanks for bringing Dr. Yusuf’s presentation to my attention. An excellent presentation and I appreciated your notes as well. I want to take this opportunity to urge you to familiarize yourself with endocannabinoid system (ECS) research. Why? Because it dispels a lot of uncertainty. Thanks for the links. I’ll take a look. Thank you for posting especially that last link. It brought to mind how fast food and restaurant foods changed to being cooked in seed oils rather than lard or tallow as used to be. Every home kitchen usually has seed cooking oils. Very good angle of consideration on the unrolling dynamics of the oft stated ‘growing obesity epidemic’. Enjoyed this. Sometimes the graphs were hard to follow as in what was completely obvious to him wasn’t explained. I do wish he had been more specific about what constituted the 50% carbohydrates. At one point where he said “if you get a hamburger, throw away the bun and eat the meat”, it seems that he is equating carbohydrates with bread – possibly grain. He didn’t mention the concept of inflammation and heart disease. Maybe some of us are not so good at processing fats. carbohydrate in the South Indian part of the PURE study was mainly polished rice and millet balls. This is fairly low-GI compared with bread. Everything he says has too be understood at a population level in the context of what people can buy or grow and afford to eat. Whether you are good at processing fats depends, more than anything, on how much carbohydrate you eat and how good you are at processing carbohydrate. Naysayers all over the place. Why do people persist in posting “nutrition facts” videos as if they were responses? If you have a response that you think can counter a statement in a blog, why not explain it clearly in a short comment, with a reference if you like (but logic should really be enough)? The Vegan Attack Hordes also have other sources, note how they used to post Plantpositive videos and now use Greger. Well, he does cite what would seem to be reputable studies that actually make a better showing of causation. Dr. Yusuf’s evidence at best reflects correlation. I don’t doubt that the healthy/unhealthy levels of saturated fat varies by person by some degree. There is a more solid line of evidence here than the FFQ data. The INTERHEART study by this group already showed that ApoB/ApoA was a good predictor of CVD risk globally, validated initially by the AMORIS study in more detail. The correlations of fat vs carb with CVD in PURE are consistent with their effects on ApoB/ApoA. The ApoB/ApoA data – like the sodium data – is based on measurement, not recollection. Regarding Bradford Hill, smoking is causal in cancer, shown by huge ORs, because smokers are exposed to lung-specific carcinogens and non-smokers are not (unless they fry at high temperatures with seed oils, but that’s another story). 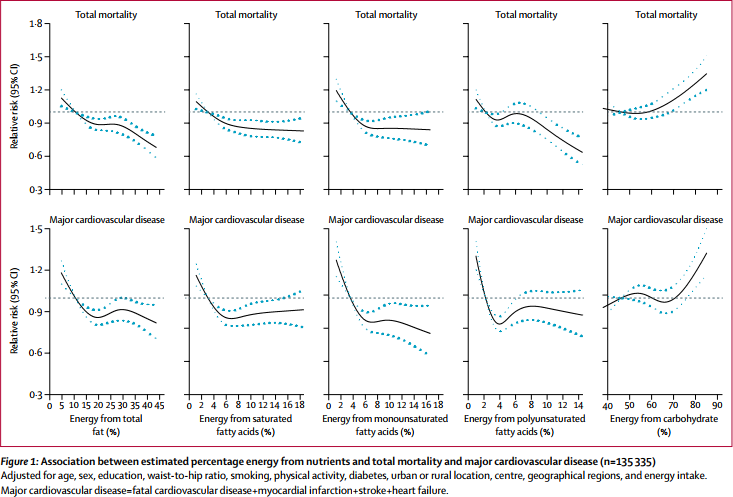 No-one today I hope thinks macronutrients are “causal” in CVD in that sense. Instead, it’s more likely that whatever causes CVD the condition is promoted by a hyperinsulinaemic and/or dyslipidemic milieu, to which combinations of macronutrients may contribute. In such a case we may have to be satisfied with lower ORs, but we’d want them to be supported by all the other Bradford Hill criteria. I think we can say this about these PURE results, if we accept that the “mixed fat” vs carb conclusion is always more likely to be reliable than any SFA/MUFA/PUFA breakdown. It’s consistent with other large modern (post-trans fat) epidemiological studies such as Malmo DCS, NHS, and HPFS, also designed to show temporality. It has a dose-response, as do those studies. There’s a mechanism and coherence, via the effect on ApoB/ApoA, and also insulin and blood glucose. Within the context of normal food availability and cost in most parts of the world today. Lung cancer is all or nothing – once you have it, changes to smoking aren’t likely to reverse it; this is not the case with CVD, atherosclerosis seems to be a natural repair process and most people probably age with some sign of it. Diet just influences whether they die of it or not, and probably can reverse it to a clinically significant extent. Why weren’t vegetables protective in PURE? This isn’t consistent with the role of micronutrition in CVD risk, nor with other studies and lines of evidence. Maybe the populations eating most vegetables globally are the largely vegetarian populations struggling to get enough protein from grains. Thanks so much for this! Finally, a mainstream doctor is getting the idea! One down, how many million to go? I’m sharing this with all my fat-phobic friends! Unless, of course, the “causality” is a genetic (or environmental, or “other” lifestyle) weakness (say) on the part of the smokers who DO get cancer, as against the smokers who don’t. OOPS! Thanks for the great discussion of this video. Sending your review around to my friends and family. If that genetic or lifestyle weakness was the cause of lung cancer, non-smokers would get it just as often. You can’t cite lack of a bulletproof vest as the cause of firearms deaths if you know about guns. A causal relationship isn’t falsified by protective factors – that some people are immune to a pathogen, doesn’t clear it of causing disease. Smoking can still cause lung cancer to a medical certainty even if not everyone who ever smoked died of lung cancer. Thank you for sending us emails telling us about this spectacular post of yours. Because I now hate social media with a passion, and stopped reading a lot of blogs (as an internet protest), I would have missed this if not for your email. For me personally, lowering calories is what works best for me weight wise (I never could get it down just counting carbs), but that said, I eat liberally of saturated fat (within my personal calorie level), and I really do feel best when I limit grain carbs. Yeah, my cholesterol is genetically high and I take Niacin which used to be a cholesterol savior but is now villified by Statin promoting big pharma companies. I will never stop eating this way/taking my niacin. It works for me. Please don’t blush – you are a genius – yes you are. Please keep this blog going Dr. Mike. I’ve learned so much from you over the years. Thanks for the kind words. I’m going to do my best to keep it going and continue to post. I got all fired up anyway. I couldn’t help myself. Epidemiological or not, I hope it got tens of thousands thinking out of the cereal box. On a per cubic inch basis, leafy green vegetables and fruit may be cheap here. On a per calorie basis, leafy greens are exceptionally expensive and fruit, other than maybe bananas, are also quite expensive – on the order of $10 per 1000kcal. Full fat ground beef (say 75% lean) is considerably cheaper per calorie, around $3 per 1000kcal. Plain white bread is, granted, even cheaper, around $1-$2 per 1000kcal, as are starchy vegetables like potatoes. Thank you for this great update and for sharing this valuable information. Sitting here enjoying my coffee and heavy cream and reading that cheese is likely protective. My girlfriend has been touting cauliflower cheese for ages. Now it looks like it might be a superfood. She also espouses the consumption of chocolate oranges, will they be next? I have read Protein Power years ago and have been following your blogs for a few years. Thanks very much for your thorough analysis of studies and books. I’m surprised that Dr. Salim’s conclusions concerning PUFA’s are somewhat neutral. Your comments echo this. I have just read Catherine Shanahan, M.D. ‘s revised edition of Deep Nutrition, Why Your Genes Need Traditional Food (1916) and she distinguishes between PUFA’s in their natural state as opposed to them in their processed vegetable oil state, which in the latter case are like poisons to the body according to lipid research she refers to. I was wondering if you have already commented on this book which I thoroughly enjoyed and if not, whether you intend to in the future. I know Dr. Shahahan, and I’ve read her book, which I mainly agree with. I have not commented on it however. There are so many books out there, that if commented on them all, my readers would get tired of it. I’ve already had a number of readers complain about the number of books I do comment on or review, because they seem to think I’m trying to use my reviews and comments to generate Amazon.com revenue. So, consequently, I’m careful about what I do review and when. Would it be true to say a “higher” fat intake combined with a “higher” carbohydrate intake is a dangerous combination with regard to weight gain and a negative health impact? If that is true to any degree…could a “low fat diet” have been the creation of the grain industry as a way to consume their products? Make fat the bad guy as it appears an intuitive conclusion and the fact that there is only a small voice on the side of fat to defend it. The grain industry has pockets deep enough to keep the low fat thing going forever, if they are the power behind that line of thinking. Could there be anything to what I am suggesting? Thank you for helping those of us who have had issues with our weight. I think that all the commodities (beef, eggs, wheat, sugar, etc.) are fighting for their share. It’s just that the grain and sugar industries got a big boost from Ancel Keys’ diet-heart hypothesis that posited fat, especially saturated fat, was a driving force behind the development of heart disease. Epidemiological studies. Who did the RCT on smoking and lung cancer? For ethical reasons, no one did the RTC on smoking. RTCs were done on animals, but not humans. All the evidence against smoking were derived from observational studies, but the evidence was incredibly strong. Whereas most observational studies show an RR of 1.23 or some such (meaning the study group has 1.23 times the risk of the control group (which is meaningless), the smoking one showed something like 15 times the risk.) Most observational studies show something like a 1.2 RR, which is why I ignore them. Give me an observational study showing 3X, 4X, 5X the risk, and you’ll get my attention. This is why Bradford Hill came up with his criteria for believability of observational studies. As someone who lives in a somewhat poorer tropical country, by choice, and who supports himself and his family by raising chicken on a commercial/farming basis, I have to sort of add to, or confirm, the local costs of fruit and vegetables and food consumption. First, some vegetables are cheap enough to eat, like the local cabbage (pechay), the local version of Chinese cabbage. Other local “vegetables” (sweet potatoes, mainly, and squash) are cheap and eaten frequently. Local fruits are somewhat less affordable, with the exception of bananas. What is wildly expensive are the various “Western” vegetables like broccoli and such. Meat is relatively expensive, with the exception of chicken. Beef is quite expensive. The big issue is the excessive carb consumption because rice is subsidized AND wheat is so cheap, leading to bakeries on every corner, and the continual carb-based “snacking” throughout the day. The other big factor here is the “behind the times” nutrition information relied upon by almost everyone. The mantra is that saturated fats and salt are bad and vegetable oils (canola, corn, peanut, etc) are good. Another cultural issue is that thin people are poor and thus malnourished. You add all that together and you get significantly lowered life expectancy. People want to be plump and well-nourished. No one wants to look poor. Now, on the other side of this, the truly poor and rural people, forced to have a basic, more primitive and local/farmland based diet, generally appear quite healthy and slender. but they have inadequate medical and dental care and grim prospects in old age, so there are some downsides as well. Thank you for the review. It pretty much confirms what most of us low carbers believe and that the majority of the establishment simply refuses to look at reality (which is true in many realms). Because of reading your Protien Power book many years ago, I have been able to keep my weight under control and understand why. Branching out, I have looked at more fat consumption, ketogenic diets and intermittent fasting as ways to augment weight loss and overall health. This is really interesting stuff and your notes are very helpful. Thanks. I grew up in Zimbabwe and the staple there (surrounding countries too) is sadza, which is cornmeal made into a fairly solid porridge then used in handfuls to soak up gravy from small or tiny amounts of meat, plus vegetables if they’ve not been sold, the point he makes. Before westerners brought maize, the staple was millet and sorghum, both more nutritious than maize but harder to grow in bulk quantities. There was a scheme to increase the growing of soya in the 1960s to 80s and also to help people outside the larger towns to rear rabbits for protein. Soya milk is protective against kwashiorkor, the chronic disease resulting from prolonged starvation. These schemes fell away as the regime there worsened. The prevalence of obesity has tended to coincide with the widespread increase in the use of maize. My mother was part of some agricultural studies in the 60s that considered this. Thanks very much for the informative history. What happened to the video of the Salim Yusuf speech? Unfortunately, the Zurich Heart House, the sponsor of Dr. Yusuf’s talk, forced YouTube to remove it. I’m keeping my eye on YouTube, because it’s showed up a couple of times before and been removed. If it pops up again, I’ll repost. Yep, but remember, even though all these studies say what I want to hear, in the end, they are just observational studies, and, as such, don’t constitute proof.